Carmelina migrated to Perth, Australia and returned to Sant’Ambrogio, Sicily. 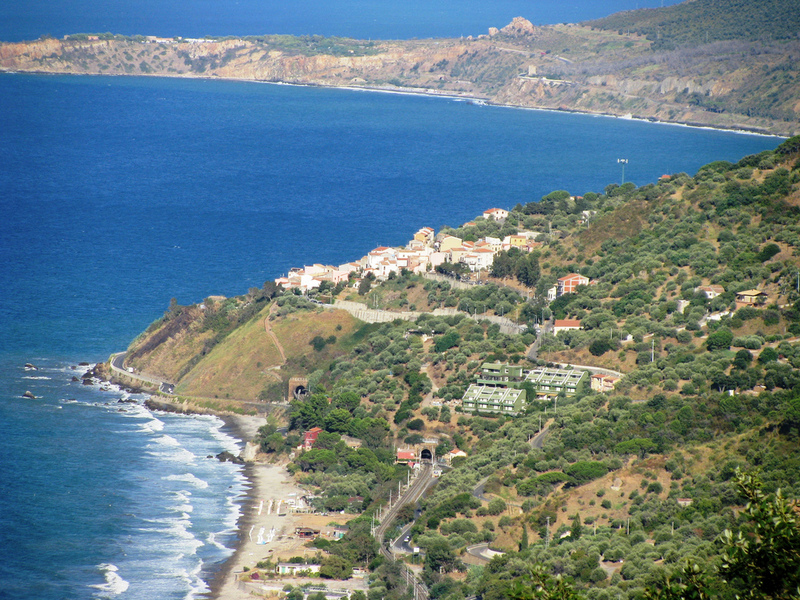 Sant’ Ambrogio, a small village in northern Sicily sits comfortably on a steep slope of the coastal Madonie Mountains. Below the houses lies the old tortuous coastal road and the Tyrrhenian Sea that, even on a windless day or night, keeps up a relentless roar as it pounds the sharp rocks. Behind the village, within the bowels of the mountain, tunnels the motorway. The fast-moving traffic has probably never heard of Sant’ Ambrogio. That the village faces the pathways of the past and is overlooked by the modern flow of traffic provides a strong metaphor for Sant’ Ambrogio – a place as much in the past as it is in the present. Carmelina Ricciardello, a resident of the village, believes that it is equally true as a metaphor for all Sicily. There can be few places in which the past has such a strong effect on the present. Sicily has succumbed to seemingly endless invading cultures – Greek, Roman, Moorish and Norman amongst others – each upsetting its predecessor’s way of life. Waves of departing emigrants seeking better lives in America, Australia and Europe must have left those remaining feeling disheartened. It has at times been showered by the ashes of a fiery Etna and rained upon by the sands of the African deserts swept northward by a wind called the Sirocco. Ignored by a distant government in Rome it had to give rise to the likes of the Mafia in order to solve its own problems. But some Sicilians are not content to allow this inward-looking behaviour to continue. Carmelina is one of them. Sant’ Ambrogio, bereft of over half its population in the 1970s is on the road to recovery as she coordinates the occupancy of some seventy apartments within the village. Through this she has set out to help restore pride and prosperity. Carmelina migrated to Australia as a seven-year old and lived for 28 years in Perth before returning to Italy. She managed five-star hotels in Tuscany and the Italian Alps, but was inevitably drawn back to her homeland. While recognizing its perceived lack of glamour, Sicily’s unpretentious beauty and relatively untainted village life soon convinced her that this area of Italy had a unique character that warranted exposure to travellers. Once Carmelina had convinced the villagers that her idea could, at least during the tourist season, bring them a steady income, she turned her attention to the village itself. Street furniture and lighting and general cleanliness were improved. The word ‘topico’ in Italy suggests a sense of pride taken by a village in its traditions. Similarly ‘campanilismo’ refers to allegiance to a local community and its culture. Carmelina suspected that both topico and campanilismo were at a low level in Sant’ Ambrogio, and she set about organizing and involving the villagers in activities that would be of interest to tourists while at the same time raising awareness of a local heritage. Thanks to her marketing skills it is now possible for visitors to meet local cheese and wine makers, take cooking and language lessons from villagers and be guided on various boating, walking and horse-riding excursions. Detailed instructions are left in each apartment for the visitor to consider. Her description of how to find the local cheese-making shepherd is typical: Walk uphill from the central piazza until two dirt tracks are reached – each with a gate. Pass through the gate that does not have a chain and in a few minutes you will reach a goat pen. Giulio will be there. He speaks no English but communication is not difficult, He will be pleased if you offer to buy some fresh ricotta. You may be lucky enough to find a sample of this cheese in your apartment when you arrive. You will certainly find bottles of locally made wine (a wonderful cabernet sauvignon called ‘litra’) and olive oil, as well as a jar of home-made marmalade. Armed with useful information about the village’s bar, trattoria, supermarket and small bi-weekly market, it is very easy for the visitor to fit into the day-by-day life of the village. A detailed calendar of special events provides added insight into how Sant’ Ambrogio and nearby towns celebrate festivals and holy days. Carmelina has no end of ideas of how to encourage the villagers to appreciate the wider world. She makes a point of requesting visitors to leave behind any unwanted novels in English, French or German, and send to her any small samples of craftwork that is representative of their home country. In this way, she hopes the locals will improve their foreign language skills and broaden their awareness of the heritage of other countries. Her latest projects include convincing the villagers of the benefits of recycling their rubbish, and converting an unused schoolroom into a small museum displaying any items that tourists might send to her. Carmelina can guide you to the many attractions within a short distance of Sant’ Ambrogio. To the east, perched on top of a mountain sits Pollina, a marvelous medieval maze in which a visitor, like any hopeful group of invaders from the past, becomes delightfully confused and lost. The Teatro di Petrarosa – a Greek theatre built of pink stone – overlooks the majestic Madonie Monutains. To the west, the coastal town of Cefalu was once also built on a pinnacle – the 200 metre La Rocca – but in the twelfth century the Norman king, Roger, banished the inhabitants from their rock and the town was re-built on land flat enough for an organized grid system of roads. It still maintains its medieval image, particularly in the vicinity of the Fisherman’s Quarter. Nestling in a valley of the Madonie Mountains, the vibrant town of Castelbuono has an attractive town centre. On the Piazza Margherita stands Fratelli Fiasconaro with a sumptuous range of jams, pasticceri and pannetone on display and available for sampling. One hour away by car or train lies Palermo with its vibrant markets – where the interaction between seller and buyer is just as fascinating as the range of food on sale – and the timeless beauty of its Capella Palatina. The architecture of Palermo leaves the visitor in no doubt as to how the buildings of one culture (Moorish) can be adapted for use by another (Norman). There is little of Sicily that is not within two to three hours drive of Sant’ Ambrogio. At the north-western end of the island lies Erice and nearby Trapani. On a good day Erice provides one of the great panoramas of the Mediterranean with views to Africa and Sardinia. Unfortunately, on a bad day visibility can be reduced to a few metres. Whether glowing in brilliant sunshine or encased in a thick cloud cover, this medieval hill town contains many layers of history and ancient legend. Agrigento and Selinunte to the south have extraordinary collections of ruined Greek temples – old golden stones lying amidst young golden wildflowers and olive groves. To the east a three hour drive brings the tourist to Taormina with its panoramic Greek theatre and the wonderful and terrible black and white landscape around Mount Etna – black from the waves of solidified lava and white from the winter snow. How enjoyable it is then to return in the evening from these wonderful sights to the quiet vias and vistas of Sant’ Ambrogio – and the local life of a Sicilian.